^[[1;36m               `+oooooo:      ^[[1;37m8888b. 888d888 .d8888b 88888b. ^[[0;36m   `/ossssso+/:-        -:/+osssso+-  ^[[1;36m888 888 888  888 Y88b 888 .d8""8b. ^[[0;34m/#.--   --.#\^[[1;37m       Make it simple and lightweight. [[0;36m                                                                  CH[[0;34m\ARCHARCHARCH[[0;36mA                 Eine flexible und leichtgewichtige Linux-Distribution. Copied from joe, so all preceding ^-s are missing here. Unfortunately, highlighting and centering stuff only work well on fixed strings, but at times not on the output of variables that change their length (like kernel or date). However I love my logo, so I've been reusing it for pimping alsi; have a look at my january screenie. Oh, if anybody is interested... I have an AUR package mkinitcpio-archlogo. Just install the package, add 'archlogo' to your HOOKS array in /etc/mkinitcpio.conf, rebuild initrd and reboot. 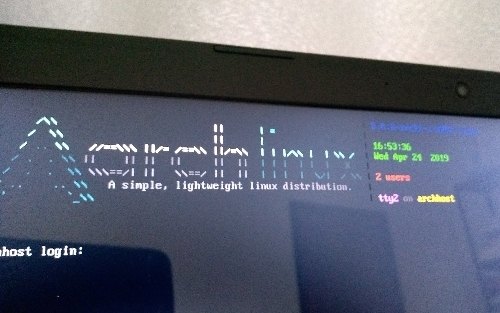 Enjoy for Arch ASCII logo while booting! The graphic displays fine but it shows the escape sequences instead of the output. Any ideas? I believe it works fine in getty/login. You are seeing the raw \s, \r, \m, \l, and \u escape sequences because you are most likely catting it or something. It should work if you put it in /etc/issue. Can I see your PS1? Its a little modified version of Phil! 's ZSH Prompt. If you want, I'll post my ~/.zshrc file. finally I got the login screen, I wanted! I don't know how to take screenshot of virtual console. Welcome to the Arch Linux forums:) I took the liberty of adding BBCode code tags around your script. We ask that you do this to set it aside from the prose, and to provide a more readable format for the code with scroll bars and mono-spaced fonts. I think you may agree that the logo is more legible. That link above is also available under every message post box on the forums. These designs look great! Thanks! moderator edit -- replaced oversized image with link.